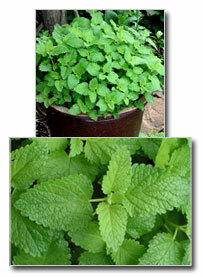 You’re sure to find Lemon Balm, Herb of the Year for 2007, this month. 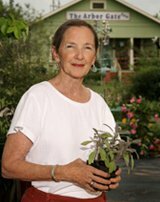 It germinates slowly during the dark cold months of January and February, but the comes on strong as warm weather finally arrives, whereupon it takes its place in the garden as a most reliable perennial. Though a member of the mint family, you needn’t fear Lemon Balm, but relish its bright flavor and hardy habit. It loves sunny and shady spots alike and requires virtually no care other than sufficient water and periodic cutting back, especially in the springtime. You’ll be rewarded by its aromatic and flavorful leaves, which are used in teas, salads, desserts, and anywhere you might have used mint in the past. This is one herb that thrives and looks gorgeous in big terra-cotta pots. As a died-in-the-wool herb collector, I can’t resist planting Lime Balm as well. It looks like Lemon Balm, but adds a lime note to the already complex flavor and scent of the standard.